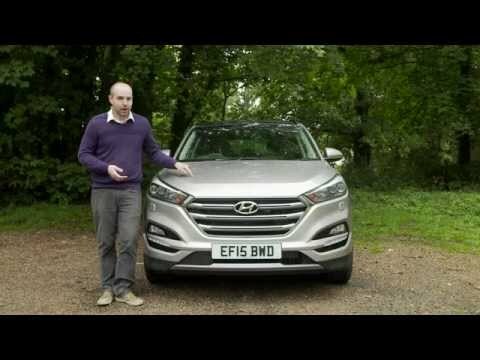 The Hyundai Tucson has proven a formidable player in the crowded compact SUV field, taking on established SUVs like the Honda CR-V and Ford Escape with a blend of styling, price and technology. This year, Hyundai dips a toe in the waters of alternative drivetrains with the Tucson FCEV, an electric model powered by hydrogen fuel cells, not batteries. Handles well in all types of weather! Especially snow and ice that's harder to drive in. I never worry during winter months. I like how it handles. Especially driving in winter weather with the ice and snow! I don't slide around on the road like other vehicles. I like that it has all wheel drive. It was the perfect size for our family but now my kids want to take friends along to places and there's not enough room for them both to bring a friend. So I would like to get a vehicle with a 3rd row of seats at some point. I also don't like that it doesn't have as many automated features as other vehicles. There's no button to press to open the trunk when you're carrying an armful of groceries from the store to the vehicle. There's also no DVD player to entertain the kids. OH, and the cup holders are not the right size!!! My drinks are always tipping because the slots are too big for my drinks. Pretty comfortable. Front seats of the car can be heated up during cold days. The Tucson 2015 is a perfect car for me and my family. It is a compact SUV that fits our need for a spacious trunk, it is super comfortable with leather seats (heat on the front ones - probably my favorite feature for cold weather), very sturdy (we take a lot of off-roads due to hiking). However, it is not the most economic one. It has the eco mode so it helps you saving gas/mile but it slows down the performance of the car on the road. So I strongly suggest the eco mode in the city, but not on the road. The leather steering wheel is slippery sometimes, so be careful with idle/loose hands. It is a very comfortable ride, particularly good seating for passengers. Overall performance has been excellent, but recently my air conditioner started to start going on and off and they did some tests and now it needs to be replaced. This is probably due to something unrelated to Hyundai, more something that might have an accidental puncture to one of the lines. The service department at my dealer is excellent and easy to schedule with. I get excellent miles per gallon, and a very smooth ride. The backup camera feature makes a big difference in ease of parking.